Join us for a time of musical worship, prayer, and prophetic words at Redemption Church on Saturday, January 13 from 7-9pm. There will be a full band and microphone set-up for prayer and prophetic words (we will be screening the words). Our desire is to create a space for people to encounter God's presence and rest in His Spirit. Although we have a structure, we are believing that the Holy Spirit will lead us. Check out the Ember Facebook page for more details. Join us for a time of musical worship, prayer, and prophetic words at Redemption Church on Saturday, December 16 from 7-9pm. There will be a full band and microphone set-up for prayer and prophetic words (we will be screening the words). Our desire is to create a space for people to encounter God's presence and rest in His Spirit. Although we have a structure, we are believing that the Holy Spirit will lead us. 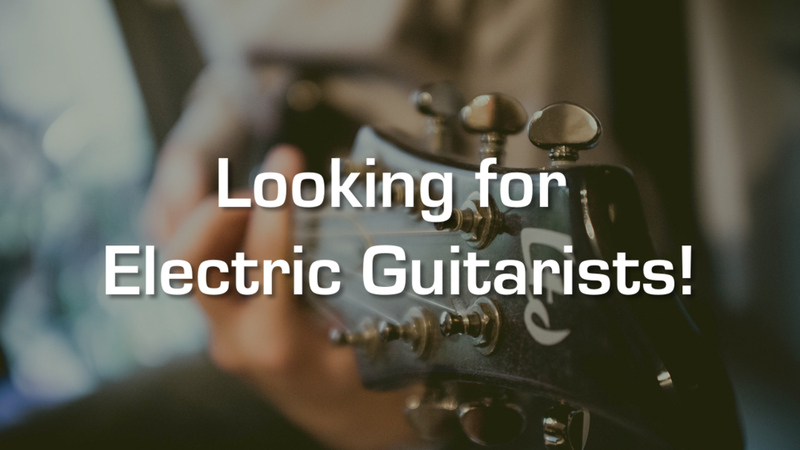 The worship team is looking for musicians who play electric guitar. Please send us an email at music@redemptionchurch.ca if you feel God is calling you to get involved and use your gifts! 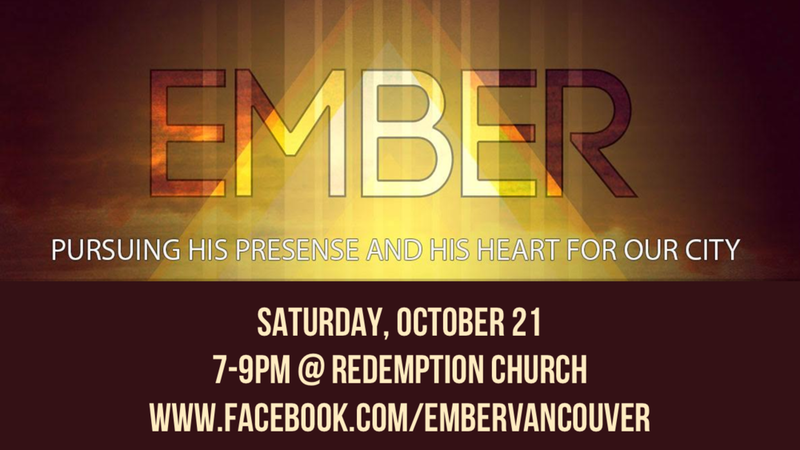 Join us for a time of musical worship, prayer, and prophetic words at Redemption Church on Saturday, October 21 from 7-9pm. There will be a full band and microphone set-up for prayer and prophetic words (we will be screening the words). Our desire is to create a space for people to encounter God's presence and rest in His Spirit. Although we have a structure, we are believing that the Holy Spirit will lead us. Join us for a time of musical worship, prayer, and prophetic words at Redemption Church on Saturday, September 16th from 7-9pm. There will be a full band and microphone set-up for prayer and prophetic words (we will be screening the words). Our desire is to create a space for people to encounter God's presence and rest in His Spirit. Although we have a structure, we are believing that the Holy Spirit will lead us. Join our worship and sound team! The worship team is looking for musicians who play bass and/or electric guitar. Please send us an email at worship@redemptionchurch.ca if you feel God is calling you to get involved and use your gifts! Are you a musician or do you really like music? Do you like worship? Are you also technical? The sound team might be a place for you to serve our church! All experience levels appreciated. We’re looking for new team members for Sunday services, Ember, and other special events. Contact Ian McLeod: sound@redemptionchurch.ca for more info. Join us for a time of musical worship, prayer, and prophetic words at Redemption Church on Saturday, January 21st from 7-9pm. There will be a full band and microphone set-up for prayer and prophetic words (we will be screening the words). Our desire is to create a space for people to encounter God's presence and rest in His Spirit. Although we have a structure, we are believing that the Holy Spirit will lead us. Join us for a time of musical worship, prayer, and prophetic words at Redemption Church on Saturday, March 18th from 7-9pm. There will be a full band and microphone set-up for prayer and prophetic words (we will be screening the words). Our desire is to create a space for people to encounter God's presence and rest in His Spirit. Although we have a structure, we are believing that the Holy Spirit will lead us. Join us for a time of musical worship, prayer, and prophetic words at Redemption Church on Saturday, February 18th from 7-9pm. There will be a full band and microphone set-up for prayer and prophetic words (we will be screening the words). Our desire is to create a space for people to encounter God's presence and rest in His Spirit. Although we have a structure, we are believing that the Holy Spirit will lead us.